This painting by Goya, hangs in Madrid’s Prado Museum. It depicts the occupying Napoleonic soldiers taking aim at insurgent Spaniards in the region known as Moncloa. The third of May, completed in 1814, now hangs in the Museo del Prado in Madrid. The scene depicts the retribution unleashed by a firing squad; soldiers of Napoleon’s army during the six-year occupation of Spain. This work should be viewed in conjunction with ‘The second of May, 1808 which shows the heroic uprising of citizens against the occupying French. The third of May depicts the punishment inflicted on those who took part in the uprising. It is not certain if Goya had personally witnessed the scene, set in the early hours of the morning following the uprising. The firing squad on the right, contrast with the irregularly arranged mass of rebels who are being shot by the soldiers. The light shed on those figures comes from a large lantern placed on the ground between the victims and the soldiers. The main figure is the man in the white shirt, brilliantly illuminated by the lantern. His stance with arms flung wide open appears as both an expression of defiance and an appeal for mercy in his defenceless state. The body of assassins, the French soldiers, are painted as a single mass; rigid and shadowy. We don’t see there faces, only the faces of the victims and bystanders. The figures to the right of centre are also either awaiting the firing squad, or they are neutral bystanders who had no part in the insurrection. They are either covering their face in shame for not helping their countrymen, or praying and covering their faces in disbelief at the horror which they are joining. This piece of work marks a diversion from the conventions of painting of the day; in it’s depiction of the reality of war rather than the more acceptable grandeur and theatrical treatment of such subject matter. The Third of May opened the way for other artists who were inspired by this work; in particular the Spaniard, Pablo Picasso and his masterpiece, Guernica. Such was the strong emotive and political content, and it was graphic in its treatment and showed the horror in an almost journalistic style. 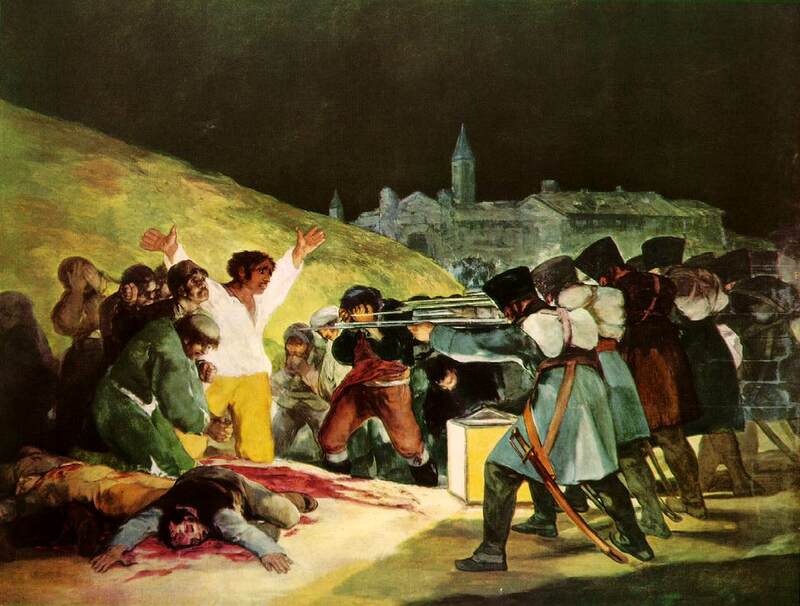 Goya had at first supported the French revolution and hoped that a similar change in Spain would have been a good thing. The Spanish King, Charles IV was considered weak and inept in his handling of affairs of state. Under the occupation of the French, Goya became court painter to the ruling Joseph Bonaparte, brother of Napoleon. While he remained loyal in this role, Goya felt a growing concern about the treatment of his countrymen, and was inspired to produce the series of drawings which would be used to develop the prints, The Disasters of War (Los desastres de la Guerra). Copyright 2019 Chris Taylor | 01506 842 717 | 07731418136.